10-14-06 With the regular season completed, Mobile International Speedway held its version of the Super Bowl this past weekend. The signature event for the Super Stock class was the inaugural Fausak 50. With sponsorship from Fausak Tires, the Speedway almost doubled the winners purse for a normal Saturday night 15-lap race. The 50 green flag lap format (caution laps would not count) was more than triple the regular race length and longer than the Super Stock class had ever raced before. The team spent weeks rebuilding the Outdoor Channel Pontiac from the last race in anticipation of the Fausak 50. Since the last race at MIS the rear end of the car was completely rebuilt, frame, rear end housing, trailing arms, shocks, body panels and a fresh Mike Woodsen motor was installed. A Thursday test was scheduled for the Moose to get a little seat time before the Fausak 50 and to shake down the rebuilt Outdoor Channel machine. Off the trailer the Moose was quick and with the 3rd practice run the team loaded the car back on the trailer to get ready for Saturday night. On race day the Moose was quick in the first practice and the team tweaked the chassis looking for the right feel for the Moose. The car was just a shade tight during qualifying and the Moose would post a 3rd place qualifying effort, 3rd to 2 track champions. The 50 green flag laps would be the longest race the Moose had ever run and patience would be the key to success. From the drop of the green flag the Moose was patiently stalking Jessie Reid, on lap 3 the Moose put the move on the R18 and set his sights on 2nd place. With the time it took to get by Reid the front 2 cars had opened up a 10-car length lead. The Lead would soon evaporate as the Moose closed with every lap and by the half way point Thomas had cleared Howard Langham for second and was looking for more. Looking and catching would become 2 different things with 3-time track champion Donnie Hamrac in the lead. The pair set a fast pace as they soon separated themselves from the rest of the field by over a straightaway. By the time the caution flag flew on lap 40 they had lapped all but 2 other cars leaving only 4 cars on the lead lap. On the restart former track champion Jimbo Devitt got a good jump and the Moose felt the heat on the first few corners but quickly pulled away looking for the leader. With the Moose in his rear view mirror Hamrac kicked his car into high gear and pulled away from the Moose and the pair would finish 1-2. The team has already started prepping to turn the Moose loose at the 39th Annual Snowball Derby at Pensacolas Five Flags Speedway in December. 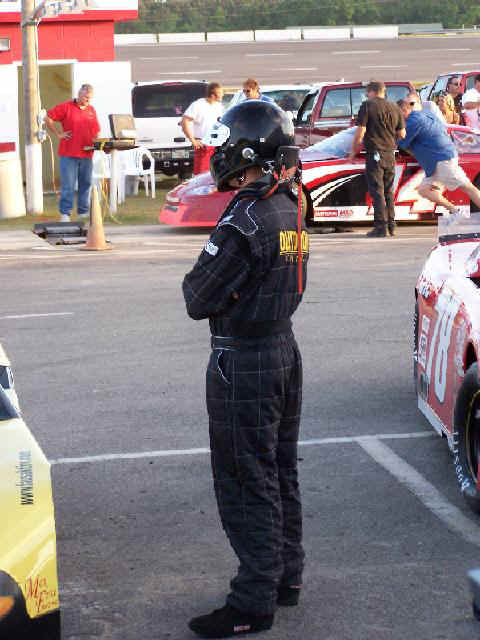 Picture attached is of the Moose on the starting grid for the Fausak 50 at Mobile International Speedway. The red and white 78 decal on the car is in memory of Charlie Bradberry. Bradberry was killed in an automobile accident a week ago and he is the 2006 Late Model Track Champion at MIS. Mobile 9-2-06 In the races leading up to Saturday night the Moose had been posting top 5s, just missing a win and picking up confidence. In order to improve on his 4th position in the points standings he needed a good night while 2nd and 3rd needed a bad night. Lined up by points the Moose would start outside the second row behind one of the guys he was chasing, that was in a back up car. When the green flag dropped the back up car in front of him didnt go and the Moose was quickly shuffled back to 8th. The Moose recovered and started to rumble back to the front. Back up to 5th the Moose took the outside line to pass the 4th place car on the front stretch. The 4th place car moved up the track to block but it was too late, the Moose was there and he hit the wall head on. Thomas slowed to keep from hitting the spinning machine and was tagged from behind, sending the Outdoor Channel Pontiac into the spin cycle. The Moose stopped spinning at the top of the track but he wasnt through being wrecked. The next car in line made a hard right turn to miss the Moose but caught the right rear tire instead. The blow ripped the rear end out of its mounts and took the body from the rear window back off the car. The wreck ended the night and the hunt to move up in the points standings. As it turned out 2nd and 3rd in points did what they needed to do and even if the Moose had won the race it wouldnt have helped him improve his points standing. The Moose ends the points season 4th in points and takes home the Rookie of the Year title. The team has already started working on the Outdoor Channel Pontiac to get it ready for the post season and the grand daddy of short track racing, the Snowball Derby in December. Picture is of the Outdoor Channel Pontiac bungee corded back together to load on the trailer. With just one night of points racing left at Mobile International Speedway the Moose has some math problems to work on. Problem #1-Taking the green flag ensures the Moose the Rookie of the Year Title. Thats the easy one. Problems 2 & 3 are a lot tougher and involve some veterans who arent interested in solving the Mooses equations but making their final night add up in their favor. Currently Jessie Reid is 3rd, 11 points ahead of Thomas and Howard Langham is 2nd 24 markers higher than the Moose. For the record, Donnie Hamrac has clinched his second title in the super Stock division. On the final night of racing there will be no qualifying or heat races for the Moose to pick up ground. It all comes down to 1 double throw down Texas chain match feature to decide it. The math is simple; in Mobile you get 3 points per spot in the feature. That means Thomas has to finish 4 spots ahead of Reid for 3rd and 7 spots ahead of Howard for 2nd. While the math is simple, its easier to take an ice cream cone from a fat kid than take points from these 2 during the final night of points racing. 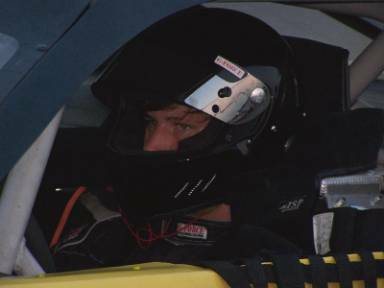 It all happens Saturday night in the Lee Fields Memorial Race at Mobile International Speedway. 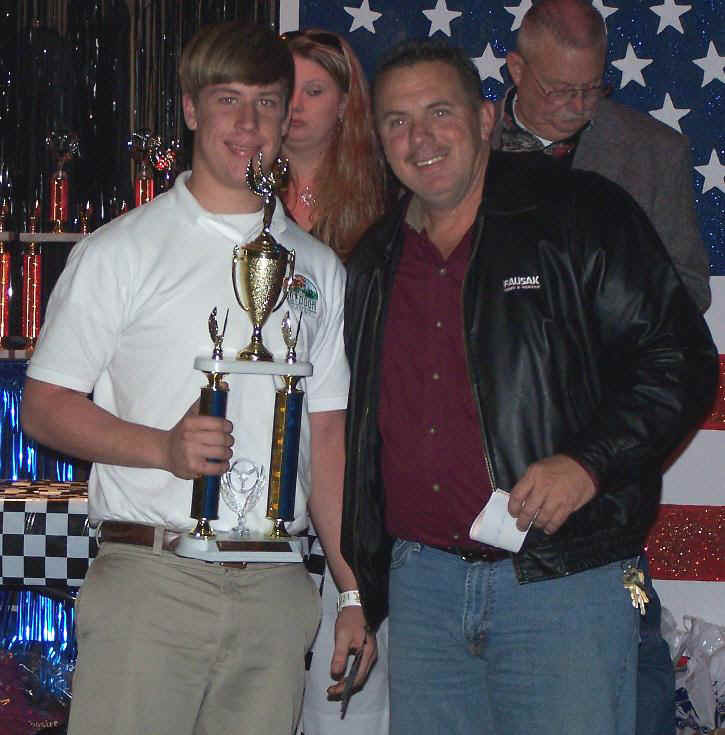 8-19-06 With just 2 points races left in the 2006-racing season the Moose was on the hunt to move up a few spots in the Mobile International Speedway points standings. As each week passes the Moose moves closer and closer to the front. Going into the weekend, Thomas was 4th in points behind 3 track veterans. The trio ahead of the Moose represent, 3 track championships, 2 Snowball Derby wins, a truckload of feature wins and thousands of laps at Mobile International Speedway. Gaining ground on these guys is not an easy task. Off the trailer the Outdoor Channel Pontiac was solid and Thomas qualified the car in the second position behind track record holder and current points leader Donnie Hamrac. For the heat race the field is inverted, fastest cars to the back, Moose and Hamrac would line up 6 & 7. Needing to get as many points as possible the Moose was on roll from the drop of the green flag. By the time the field exited turn 2 the Moose had the lead. By the time he entered turn 3 he had a partner, Hamrac. Hamrac had been in the Mooses tracks through the field and now they were side by side heading into turn 3. Moose on the inside Hamrac hung out on the outside. The pair traded the lead 6 or 7 times each lap. On lap 4 Hamrac made the crossover move and was under the Outdoor Channel machine and it looked like Thomas would have to settle for second. The Moose had other plans and he dove hard into turn 3 on the outside. With the rolls reversed the pair made their way to the checkered flag, again swapping the lead 6 or 7 times each lap. With the white flag in the air both drivers were bowed up like a Halloween cat inside their cars. The Moose dove into turn 3 deeper than the car should have been able to handle but it stuck. He had the lead on corner entry, Hamrac battled back on the inside; he had the lead in the center of the corner. Off the corner the Moose had the momentum swinging in his favor and he had the lead (See picture above courtesy of Gerald Hodges) with 50 feet to the finish line. Track champions dont give up easy. Hamrac gathered up his momentum and took the lead at the line by less than a bumper. That was just the heat race. 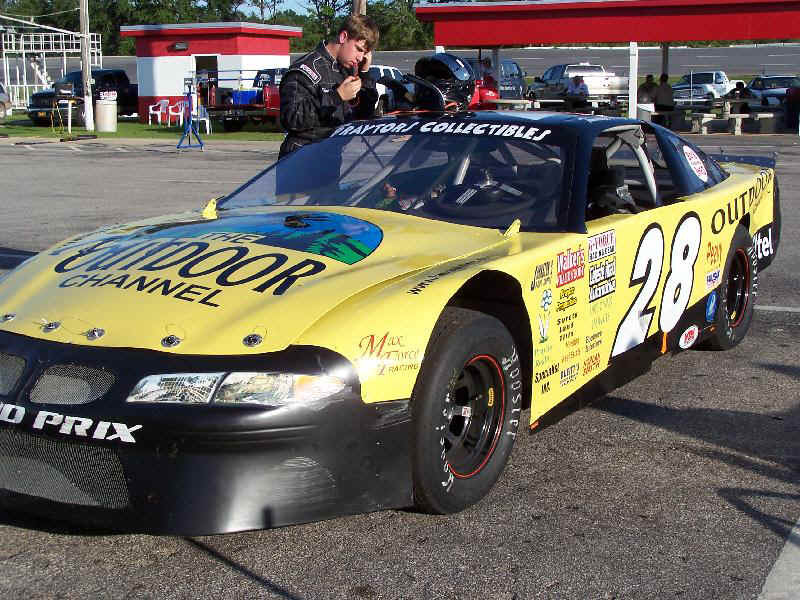 With just 3 races left in the 2006 the Moose rolled out his Outdoor Channel Pontiac looking to improve on his 4th place spot in the 2006 championship standings. The Super Stocks were an under card to the 100 Lap Super Late Model show at MIS on Saturday night which meant there would be no qualifying and the field would line up by points. 4th in points would land Thomas on the outside of the second row and looking for a quick way down to keep from getting freight trained by the field. The green flag dropped and somehow the Moose found his way to the bottom by the first turn. Trouble behind him would bring out a caution and a complete restart. On the restart the rest of the vultures were ready and by the time the field left turn 2 the Moose was shuffled back to 7th. Another caution on the first lap and the there would be another complete restart. This time the Moose was ready for the vultures behind him and by the exit of turn 2 he was in the preferred groove in 4th place while the vultures were looking for a way around. As the field sorted out, the front 2 put some distance on the Moose as he tried to work around former track champion Howard Langham. As he cleared Langham another former champion, Jimbo Devitt, slipped underneath him and took the 3rd spot. While this was going on the front 2 set sail on 3,4 & 5. The Moose went to work on Devitt for 3rd and every time he would get close for the pass the car would loose grip and ground on 3rd. From the grandstands the car looked loose, after the race we found the front of the car covered in oil from the car he was chasing. Oil and grip dont go together and the Moose finished 4th. While the championship is all but decided spots 2-5 are separated by less than 100 points with 2 races to go. 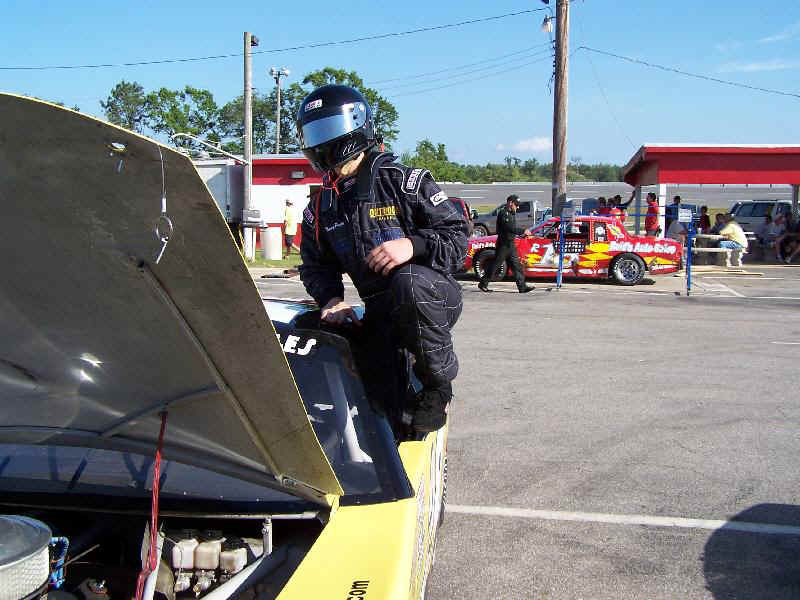 As the 2006 regular season at Mobile International Speedway winds down the Moose continues to improve and is starting to flex a little on track muscle. For the first time in 2006 the Moose started on the pole for the feature race. 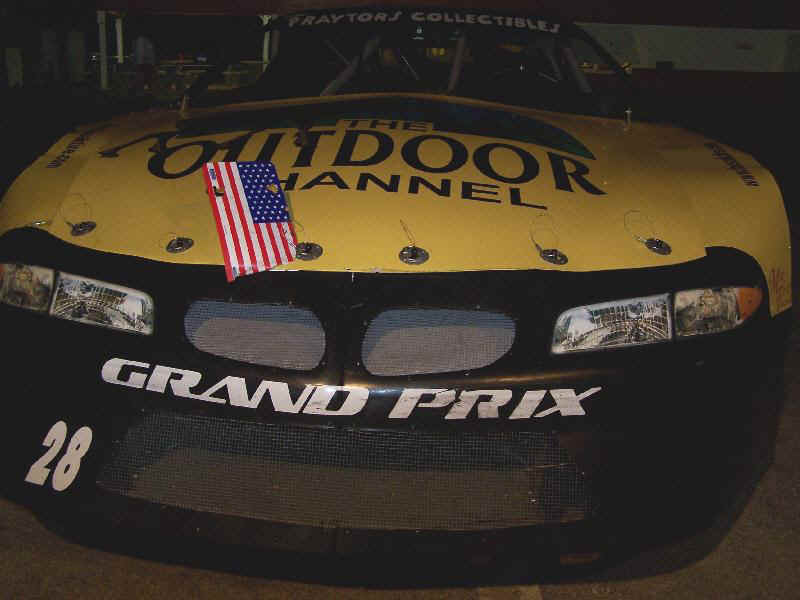 From the drop of the green flag Thomas was running the Outdoor Channel Pontiac for all it had. On lap 3, one of the guys moved Thomas out of the lead and into the outside groove. The Moose would fight back on the high groove and run side by side with the leader until falling in line in 3rd place. Back in the preferred groove Thomas repassed the driver that had moved him, cleanly and set his sight on the leader. However, the new leader was 2 time track champion and current track record holder Donnie Hamrac. Clear of the other cars Hamrac and Thomas quickly put 10 car lengths on the rest of the field. Hamrac showing he had the fastest car with Thomas sending notice to the rest of the field that his days as a rookie were quickly coming to an end. The caution flag would fly with 5 laps to go and bring the field back together. On the restart, Jessie Reid, one of the track veterans, would get a good jump on the Moose and they would go side by side into turn 1. Side by side they raced going into turn 3 when another driver decided to take them 3 wide into turn 3. Three wide works at Talladega but it doesnt work at Mobile International Speedway. Everyone thats turned a lap at MIS knows that. You would think the former track champion that did it would know that too but Saturday night he left his brain in his other helmet. The 3 wide move made the Moose the meat in the 3 wide sandwich and it didnt turn out for him with the left side of the car being destroyed. 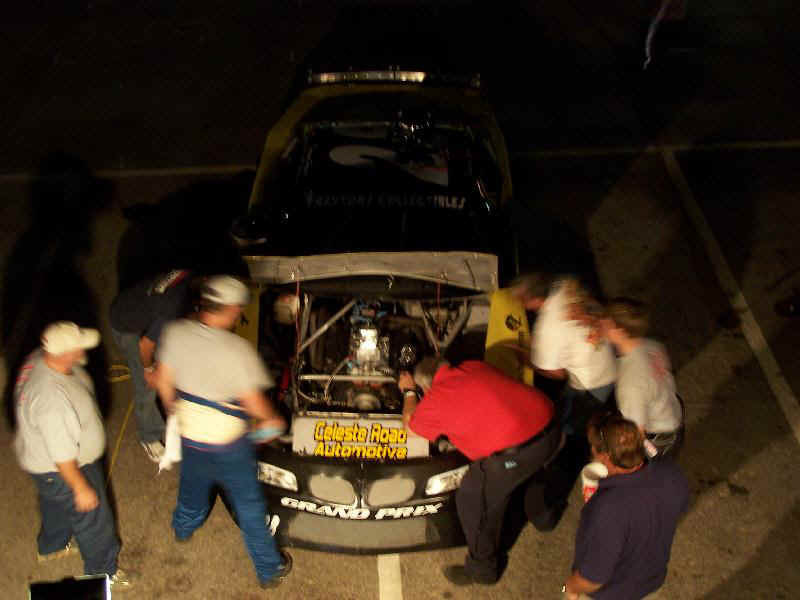 The team tried to get the car back together to finish but a broken brake line would end the night. Even with a bad finish in the feature, a good qualifying effort and a good finish in the heat race would be enough to move the Moose into 4th in the overall points standings and closer to clinching the Rookie of the Year title. The team will shake down the remade Outdoor Channel Pontiac tonight and be ready to race tomorrow night as part of the rained out 100 lap festivities from 2 weeks ago. Six years ago, Thomas Praytor was part of the Outdoor Channels ARCA Racing This Week film crew when we interviewed Tony Stewart at the new NASCAR Silicon Racing in Birmingham. The Moose had an opportunity to race with Stewart on the new game and came out on the short end of Stewarts bumper. 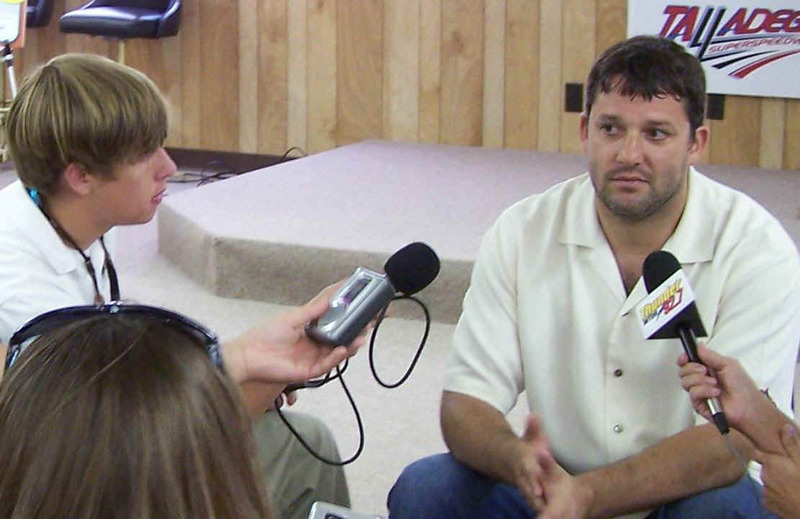 Six years later Thomas was part of the assembled media to interview Tony Stewart at Talladega Superspeedway. Stewart was at NASCARs most competitive track to preview the repaving project that is underway. 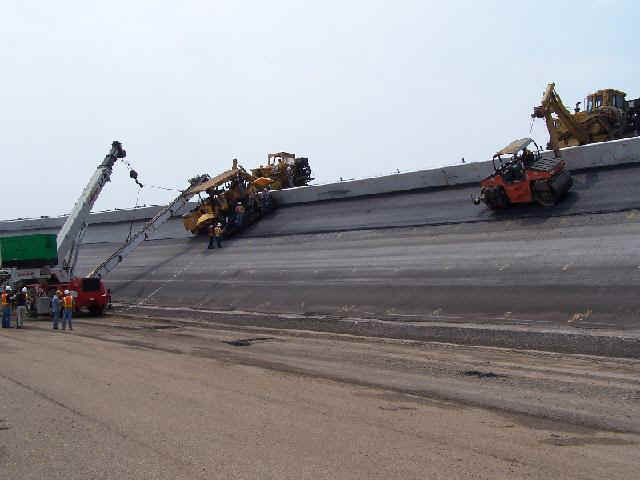 The resurfacing is a huge undertaking that requires massive bulldozers outside of the track to hold the paving machines up on the banking and to keep them from tumbling down. Six years later it appears the Moose may have grown two feet while Stewarts stature in NASCAR has grown even larger with 2 Nextel Cup titles under his belt since their last meeting. Reminded of their previous meeting and the difference in size today, Stewarts comments reflected those words given to him by A. J. Foyt several years ago. The complete Tony Stewart interview will be heard on Fausak Tires Inside Alabama in the upcoming weeks. 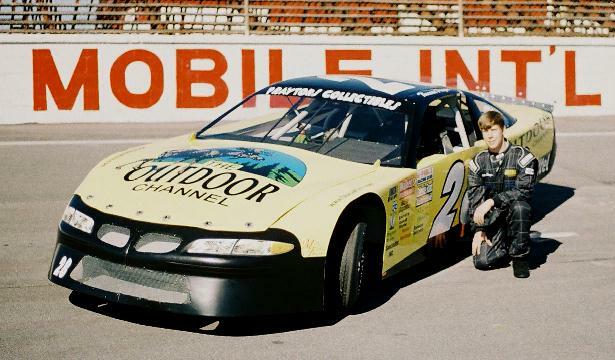 The Moose is scheduled to test his Outdoor Channel Pontiac Tuesday night for the next round of the 2006 Season at Mobile International Speedway. The Moose is currently leading the Rookie of the Year points standings and is now just 18 points out of 4th place. Thomas rolled into MIS last Saturday night with a car that had broken the 20-second barrier in Thursday nights practice session. In doing so he became a member of very elite club with only a handful of members. Pumped up by a great test the Moose was ready to roll on Saturday night. The first practice session went as planned, the second would be a different story. On the second lap the motor went south with a blown head gasket and it looked like his night was over early. That was until Bo Wilkinson stepped in with his car to keep Thomas going. The Moose made the best of a bad situation and qualified 7th. The team used the heat race to make the car better and the Moose was in contention for a top 5 finish when the handle went away on his car and he settled for 7th place finish. Thanks to Wilkinson Thomas moved closer to the 4th spot in the points standings and stayed on top of the rookie of the year points. 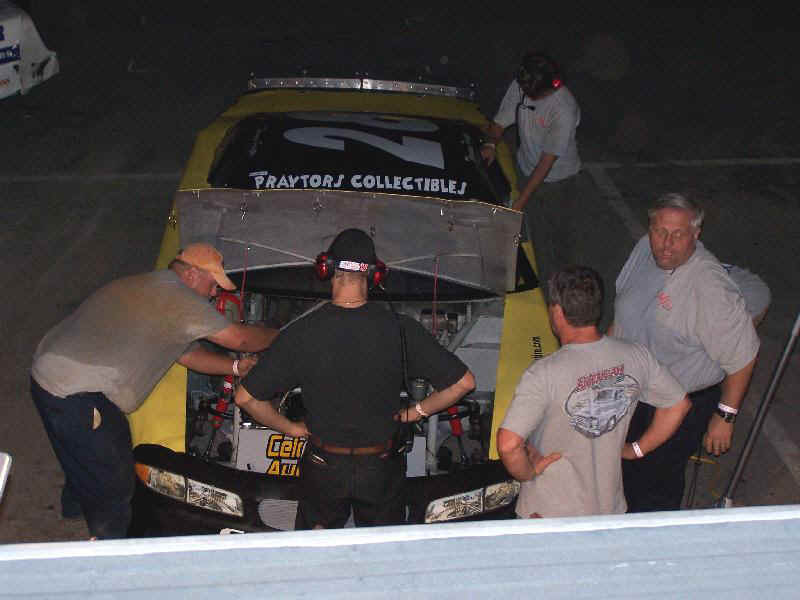 Coming off a successful Thursday night test the Moose was loaded for bear for round 8 of the 2006 season at Mobile International Speedway. Off the trailer the Outdoor Channel Pontiac was a little loose from Thursday nights test but still quick. With the Super Late Models in town for the 100-lap event the Super Stocks did not qualify and they lined up by points. Thomas would start 5th, based on his current points standings, 5th behind 4 tough veterans. From the drop of the green flag the Moose was on the loose, 2 by 2, 3 rows deep the front 6 circled the high banks of Mobile International Speedway. The front group finally fell in line and the Moose went to work. Going into to turn 1 Thomas and the 30 got together, with the 30 coming out on the short end of the stick and the Outdoor Channel machine picked up the spot. On the restart the Moose lined up behind former track champion Howard Langham and unlike the last race he wasnt fooled on the start and he and Langham went off into turn 1 nose to tail. As the laps wound down Thomas kept the heat on Langham while Langham kept the heat on the next man in line. Nose to tail again, with the front group leaving the rest of the field. The Outdoor Channel Pontiac was better getting into the corner while Langham was better coming off. On each corner Thomas would close the gap to Langhams bumper and Langham would pull him a car length down the straightaway. Lap after lap was the same with Thomas never being able to gain an edge and the veteran never slipping. Thats how they would finish, nose to tail at the stripe. The Moose takes home a 3rd place finish and solidified his position as the leader of the Rookie of the Year points standings and 5th in the overall championship standings. The team will be back in action again on July 8th at Mobile International Speedway for Hawaiian night for Ronald McDonald House. 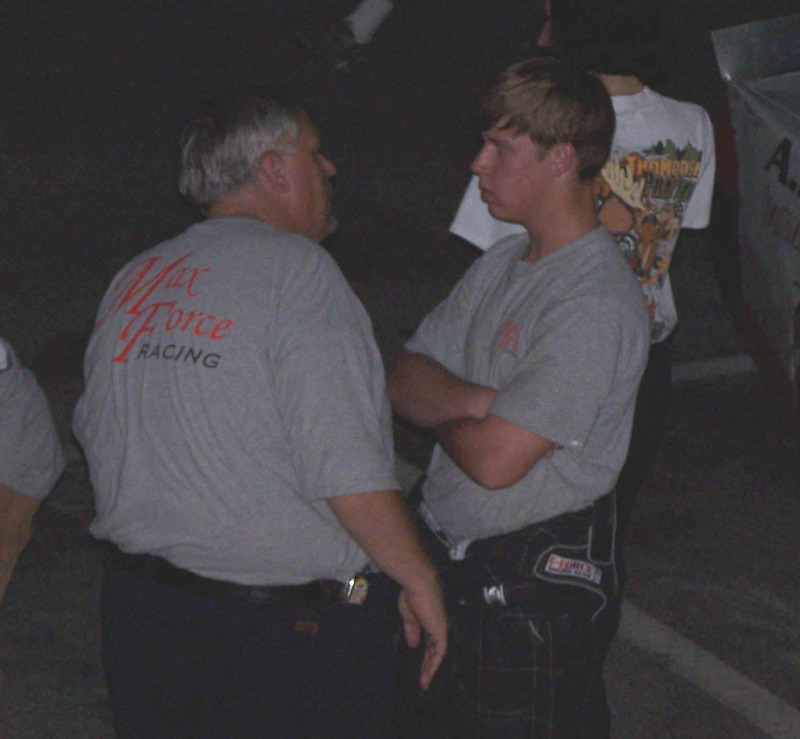 Picture attached is of Thomas and 2-time track champion Donnie Hamrac talking after a practice session for Saturday nights race. Picture courtesy of Catlin Clicks Photography. Three days of misery leading up to the race had our race team beat down and wondering if we were headed in the right direction. During the Thursday night test the Outdoor Channel Pontiac experienced what we thought was an electrical failure that shut the car down under power. A long day in the shop led to a Friday night test at Mobile International Speedway. Two laps into the test the team realized we had not solved the problem. Three hours of searching at the track netted no improvement. The team scheduled a house call to Fausak Tires and Service for their mechanics to debug the problem, we netted no concrete results. Back in the shop Tom Claxton and Mike Woodsen, with over 50 years of engine building experience put their healing hands on the car and we loaded up for the racetrack. Job 1 at the racetrack was to see if the car would run. While everyone held their collective breath the car made 5 laps. Now that we knew it would run it was time to see if would really run. The Moose stabbed the Outdoor Channel machine into turn 1 and he was on a rail. We tweaked on the car to free him up a little in the center of the corners and rolled him out to qualify. Lap 1 was a new best time for Thomas, lap 2 was even better and he was on the provisional pole. The final car to qualify was 2-time track champion and the current track record holder, Donnie Hamrac. Hamrac would take the pole by less than a tenth of a second. With the dice roll setting the front 6 positions Thomas would start 3rd behind Hamrac. The Moose was rolling to a good start and missed a shift that dropped him back a couple of spots to 5th. By lap 5 Thomas had made up the lost ground and was back up to the bumper of Chris Loepke who looking for a way around Jessie Reid. The 3 ran nose to tail for several laps before Thomas was able to get around the both of them. A caution flag bunched the field back together and the Moose was now 3rd behind Hamrac and Howard Langham, both track champions. On the restart the veterans pulled an old short track stop and go start that left the Moose in a deficit. With just 6 laps to go he was able to close the gap but it was more than he could overcome and he would finish third behind the pair of veterans. Thomas leaves round 7 of the 2006 season 5th in the overall points standings and is the rookie point leader. The track will be back in action on June 24th for the 3rd installment of the Miller Lite 100 Lap Super Late Model Series. 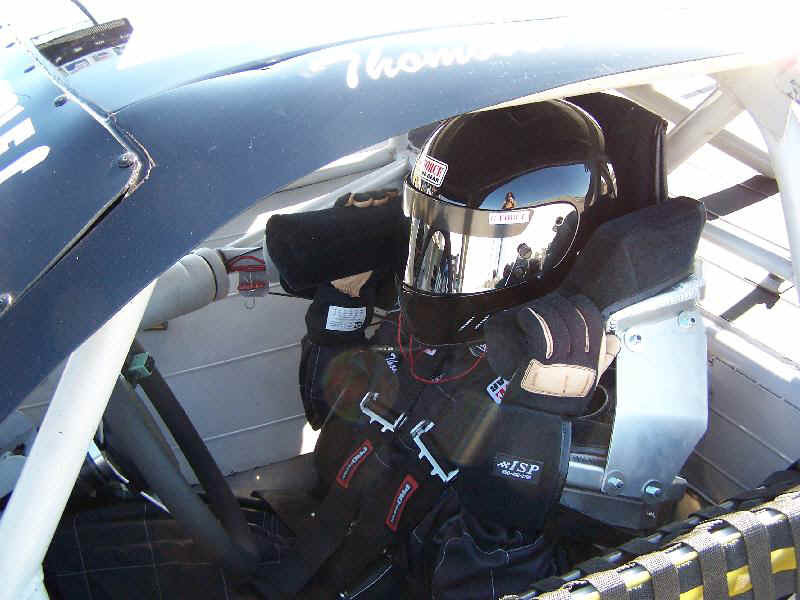 Picture attached is of Thomas strapped in for qualifying the Outdoor Channel Pontiac. Picture courtesy of Catlin Clicks Photography. Mobile 5-27-06- Thomas ended his school year on Friday morning and quickly made his way to the racetrack for a test session in his Outdoor Channel Pontiac. Penned up from weeks of studying for final exams the Moose was loose on Friday night. The car was quick and the Moose was ready for a big Saturday night of racing at Mobile International Speedway. With the track hosting round 2 of the Miller Lite Super Late Model Series at MIS the Moose would only get 1 shot at racing on Saturday night and he would have to make it count. In the first 5 races of the year the veterans had taken the young rookie to school on how to get around the high-banked oval. Specifically, they had worked him over on the start and he would spend the rest of the night playing catch up. Part of the Friday night test was devoted to starts and restarts and the practice would pay dividends. As the pace car left the track on Saturday night the Moose had a horn on Jessie Reids bumper (Reid and Langham were doing double duty Saturday night racing in the Super Stock and the Super Late Model Race) going into turn 3 and stayed there until they dropped the green flag, then he had 2 horns under Reids machine. The Moose sent his first notice to the veterans he was here to race. The field bailed off into turn 1 and another veteran, who had Thomass usual starting spot outside the front row, tried to make a hole that wasnt there. The Moose held his line and put that car into the spin cycle. Second notice, the Moose was here to race. On the second restart the field would get settled down into single file. Thomas found himself in 5th looking for a way around Chris Loepke. Lap after lap the Moose pressured the 30 car and had just completed the pass for 4th when the front 3 cars started spinning in front of him. A quick move to the bottom of the track and he cleared the spinning cars. The Moose had the point with the caution flag in the air and 2 laps to go. Under MIS rules when there is a caution, the field reverts back to the previous green flag lap. Since, Thomas had just cleared the 30 car of Chris Loepke, the 30 was moved to the front and Thomas was now 2nd. The Moose had 2 laps to get by the guy he had taken 13 laps to get by before. A good start had the Moose in a full charge and on the bumper of the 30. The Moose was better getting into the corners and the 30 was better coming off. If MRN had been at the race the final lap would have gone something like this. White flag is in the air. The final lap of what has been a slam bam affair in the Super Stocks tonight. Chris Loepke leads the field across the start finish line. 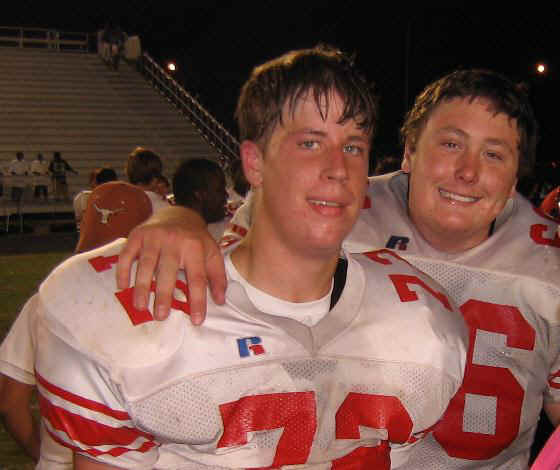 Both of these guys are hungry, looking for their first win of the 2006 season. The 28 of Thomas Praytor on his bumper they dive into turn 1; Praytor is all over the back bumper of the 30. This is going to be close! Off of turn 2 Loepke gets an advantage. Praytor looks low thinks better of it and moves back in line. They bail off into turn 3 for the final time; Praytor has a big run on Loepke. THEY TOUCH! THEY TOUCH! Loepke is sideways. They bang off each other again, Praytor to the high side as the come off turn 4 side by side. Its a drag race to the finish line and Chris Loepke wins by a half a car length. Final notice the Moose is here to race. Last Friday night the Thomas closed out Spring practice for St Pauls Football with their Spring game. The Moose started his night at center and took a turn on defense in the 2nd half recording a sack in the St Pauls win. 5-13-06 With a couple of weeks between races Thomas had a couple of opportunities to test his Outdoor Channel (TOC) Pontiac for round 5 of the 2006 season at Mobile International Speedway. The team tried several different setup packages that would help the Moose be quick not only for qualifying but also in race trim. With another 200 laps of testing under his belt we turned the Moose loose at MIS. Off the trailer the TOC Pontiac was as good as the last test and the Moose turned in a 4th place qualifying effort. Another unlucky dice role by the pole sitter Donnie Hamrac would put Thomas outside the front row again for both the heat race and the feature. Outside the front row is the worst starting spot and now Thomas would have it for the 3rd time in 4 attempts. The Moose got a good jump in the heat race and was side by side with the 1st place car in turn 2 when he got tapped from behind. The TOC machine looped around backwards and took flight off of turn 2 and the Moose became the latest driver to earn his MIS wings. Luckily, the car rolled to a stop before it had an opportunity to hit the exterior retaining wall. After a chance to check his fire suit the Moose restarted the car and made his way back to the racing surface. Back on track Thomas shook the car down and it felt good enough to continue. At the drop of the green flag the car was wicked loose and the Moose was hanging on to an ill handling racecar. We would find out after the race that the left rear tire was down on air pressure by 10 pounds and that was the culprit. Between races the guys at Fausak Tire dug out a pound or so of dirt and grass from the left rear and it was ready for action again. The feature would hold almost the same luck for the MIS rookie. Going into the first turn of the first lap the Moose was horned into the third groove as one of the guys made it 3 wide. Out of the preferred groove the Mooses tires were covered in track debris and he was having a tough time finding grip and he was sliding straight to the back. At the halfway point the caution flag was in the air and the team called Thomas to pit road for some adjustments on his machine and he was back on track. With cooler tires and a couple rounds of wedge jacked in the car the Moose was back on the hunt looking for positions. When the checkered flag dropped Thomas was back up to 6th and closing in on the 4th and 5th place finishers. 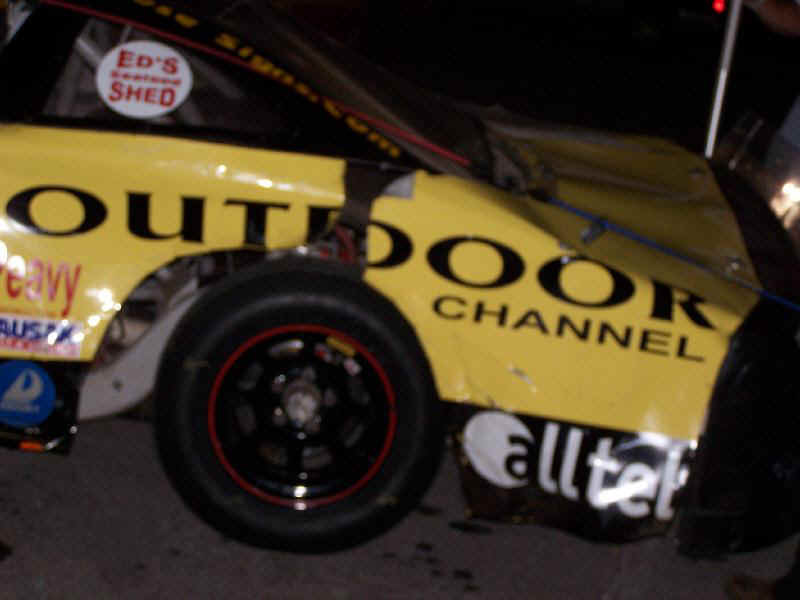 Coming into week 4 of the 2006 racing season at Mobile International Speedway the Outdoor Channel team had been quick in qualifying and posted some solid finishes. Saturday night would start the same way with the Moose posting the 3rd quickest qualifying time and without an invert for the feature a solid starting spot behind 2005 track champion, Donnie Hamrac. Thomas knew a solid finish would depend on a good start. As the green flag flew the Moose was on the champs bumper (see picture) as they bailed off into turn 1. Donnie's brother Eddie was outside of the Outdoor Channel Pontiac and the Moose was the meat in a Hamrac sandwich. Off of turn 2 Eddie lost the handle on his machine spinning sideways in front of the Moose. A cloud of smoke, dust and spinning race cars covered the race track with the Moose emerging from the fog with his car in 1 piece. A red flag followed to clean the oil and debris from the track and the field was reset. The first corner of the restart would be clean and the field started to sort itself out. From the first corner the Moose was fighting a tight race car, it wouldn't turn off the corner. Five laps in, the 2004 track champion Howard Langham put a move on the Moose to push him back to the 6th spot. The Moose fought hard to get back in the top 5 and was underneath the 5th place car on the last lap when his wiggled off of turn 2 and he would have to settle for 6th. The track takes a 2 week break but the Moose will be testing and working on getting better for the home stretch. Thomas on his night; "The wreck on the first lap was pretty wild! I'm not sure how I missed it or if I can tell you what I did. All I know is I was looking into Eddie's eyes with his car sideways on the track and then I was by it. I'm still learning from the guys I'm racing with. They've been doing for a long time and they are taking me to school on the starts. I'm getting better at it but I still have a lot to learn." After struggling with mechanical issues in week 2, the Moose rolled his Outdoor Channel Machine into Mobile International Speedway looking for some pay back in week 3. Off the trailer the car was decent but not what the team was looking for. The guys made wholesale changes from practice to qualifying and the Moose turned an awesome lap. 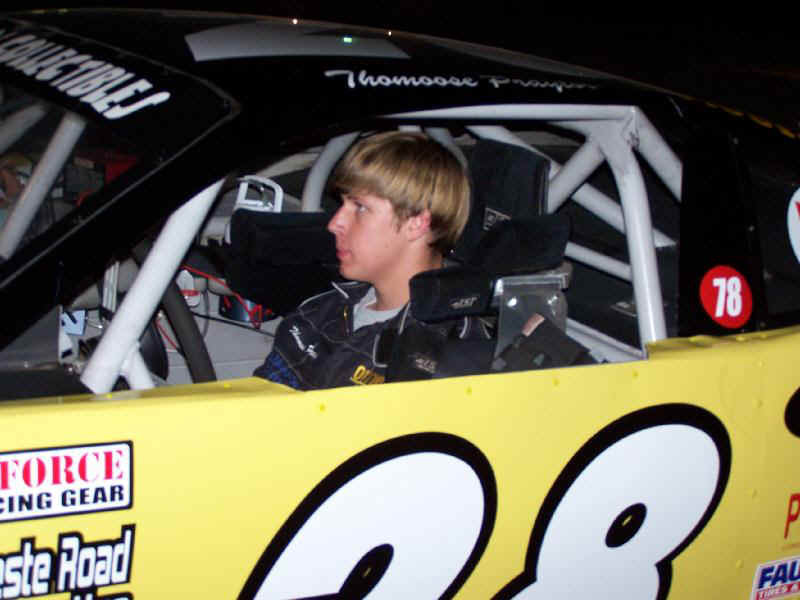 Thomas's qualifying effort was second only to the track record holder. That was the good news, the bad news is, second put him outside the front row for the start of the race. The problem with second is you can't get down to the preferred groove until the rest of the fast cars get by underneath. Saturday night would be no different with the Moose finally horning himself a spot in the 8th position. The Moose needed a caution to get the field bunched back up but it was not to be, once again the race would go green the entire distance. Thomas was able to pick off a few cars and would work his way up to 5th before the checkered flag flew. The Outdoor Channel team tested again on Thursday night looking to get the Moose some more seat time and find some more speed for Saturday night. Thomas turned over 100 laps on Thursday getting valuable seat time and the team may have found a few more tenths in race trim. Thomas will be part of the grand opening celebration Friday afternoon at DeWayne Musick's and Jerry Turi's, Gulf State Wireless, on Davis Highway. 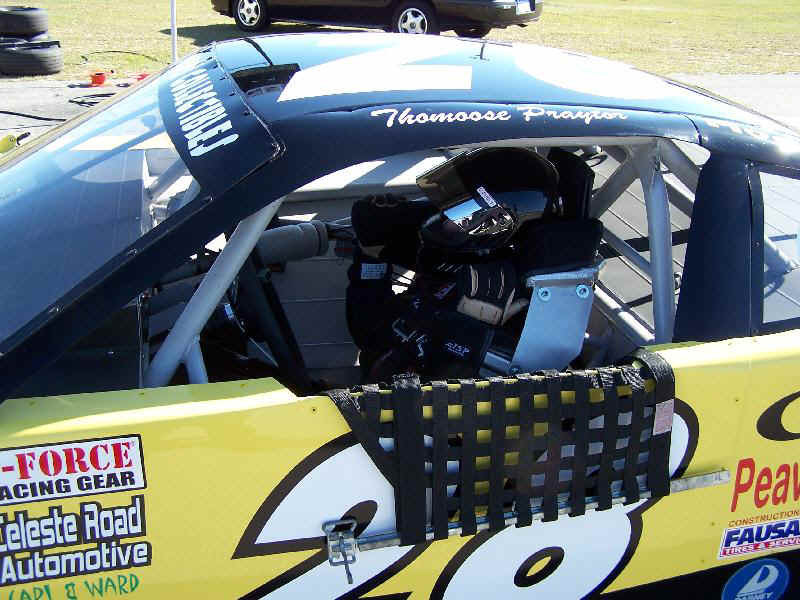 After a solid opening night Thomas was looking forward to week 2 of the 2006 season at Mobile International Speedway in his Outdoor Channel Pontiac. The team tested Thursday night and what was thought to be an electrical issue haunted the team all night. The car would make 2 laps and the motor would start to break up under acceleration. The team replaced all the parts they had at the racetrack on Thursday and then replaced every other electrical part on Friday. On Saturday the team tested the car up and down Michael Blvd and it appeared we had the problem fixed. The only way to know for sure was to get it on the track. After making 2 laps the problem returned. With all of the electrical replaced the team went to work on the fuel side of the equation. With just a few laps under his belt the Moose was able to qualify 5th on 7 cylinders with a car that sputtered around the track. Mike Woodsen went to work under the hood and after 2 hours of non-stop work and testing the problem was found. A weak spring helped along by a sticking valve on the number 2 cylinder was the culprit. It could only be found after the motor was put under race pressure. In tracking down the problem the team borrowed something from almost every super stock in the garage. The team spent yesterday pulling the motor a part to get the heads to the machine shop to try and get them back for this weekend. Thomas on the weekend, It was just one of those weeks. Everybody worked non-stop after Thursday night and it took all of that to find the problem. Mr. Mike was at the shop all night Friday night and at the track on Saturday, he really busted his behind for me to race and I cant thank him enough. We already have the motor ready to go the shop and I hope well be back this weekend. As bad as I wanted to race Saturday night it really didnt seem to be that big of a deal in the end. During the night we borrowed a carburetor from Chris Cotto. When I took it back to him, he had just found out his brother was killed in an accident. Wanting to race just didnt seem to be that important compared to what Mr. Chris was going through. 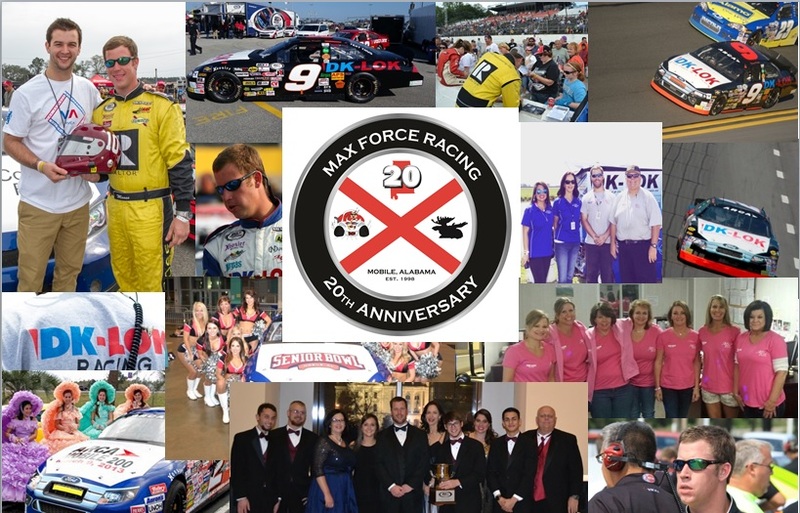 Ive been thinking about him a lot, our race team (Max Force) is named for my brother Max who passed away too. Picture Team moving in fast motion working on Outdoor Channel Ponitac. 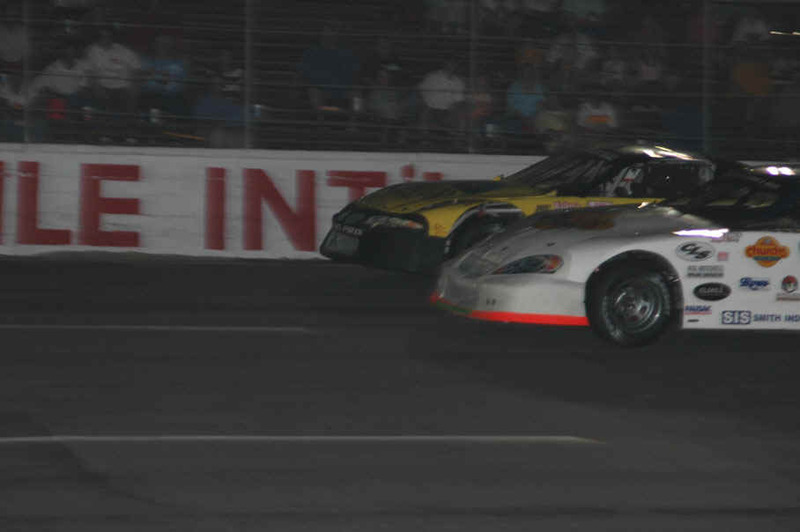 Months of testing came to an end with the opening of the 2006-racing season at Mobile International Speedway. The Moose had the Outdoor Channel Pontiac rolling off the trailer and he posted the 3rd fastest qualifying time of the night, just edging out 4-time track champion Steven Davis. A 3-car invert put Thomas on the outside of the front row of an experienced Super Stock field. The field represented 7 track championships, 5 track records and the winners of the Late Model and Super Stock race from Friday night in Pensacola. The field was loaded with guys who knew how to get around and the Moose was in the worst possible starting spot, outside the front row. In a 15 lap shootout at MIS outside of the front row is the worst possible starting position, you get hung out to dry while the rest of the field gets in line and goes by, Saturday night would be no different. From the drop of the green flag the Moose was hung out and looking for a spot to get down, the outside groove at Mobile is a tough place for veterans, much less a first night rookie. After 2 laps on the outside the Moose finally was able to get down and was 9th. By the time he got down the field was strung out and the team really needed a caution to get the field bunched back up, it was not to be. The race would go green flag from beginning to end and the Moose would pick up a few spots for a 6th place finish. Thomas on his night: Im disappointed, we had a better car than our finish showed. The first corner of the first lap showed what a rookie I am. Steven, Donnie, Jessie, Shannon they all found a spot to get to and they left me hanging out. On the plus side I didnt tear up the car so well get to spend the week getting better for next week. Picture; Thomas and 2 time track champion and new track record holder Donnie Hamrac. With the season opener at Mobile International Speedway getting closer Thomas tested his Outdoor Channel machine with 2-time track champion Donnie Hamrac. With some rubber finally on the track from the Sprint cars, the 2 hours test session was a lesson in freeing up a tight racecar. The Moose had an opportunity to follow Hamrac, the current track champion, and pick up on some of the finer points of getting around the high banks of MIS. The test was a success with the Moose picking up speed as the test went on. Thats the good news, the bad news is with 10 minutes left in the test, the motor on the Outdoor Channel machine exploded and the Moose went for his first ride off of turn 3. The car was saved but the motor is only good for scrap. Our motor team is hard at work putting together new motor in time for opening night on April 1. Thomas on his test: Ive been testing by myself for the last few months and I really appreciate Mr. Donnie letting me follow him around. I thought I was pretty smooth until I got behind him. That was the first time Ive had a motor blow up on me. That, that was a wild ride off the back of turn 3, I dont want to do that again. I cant wait to get it all back together and get back to the track." Mobile 2-26-06: With the 2006 racing season inching closer, the testing schedule for the Moose is picking up speed. 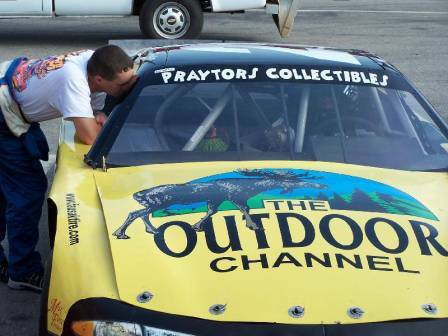 This past weekend, Thomas logged over 100 laps on The Outdoor Channel Pontiac at Mobile International Speedway. 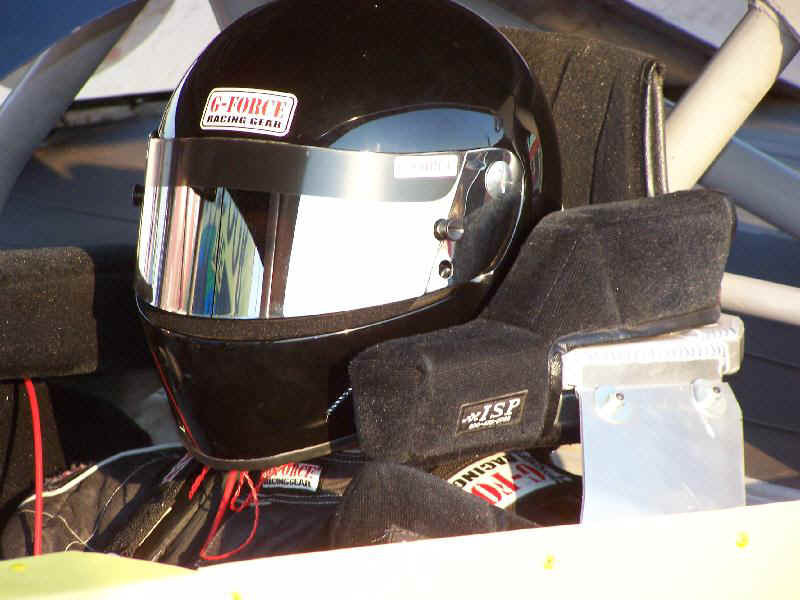 Testing up until this past weekend was all about gaining a familiarity with the racetrack and the heavy stock car. This past weekend the team worked with the driver on picking up speed. After spending the first half of the practice session going in the wrong direction, the team threw its past notes out the window and started listening to the new driver. With each session on the track, the team worked on the chassis based on the drivers input and with each session the lap times got faster. The Moose is not old enough for a drivers license but his experience as a driver gives him the ability to give quality feedback from the racecar. By the end of the session the Moose was turning laps over a half second faster than when the team unloaded. Two or three more test are currently scheduled before opening night on April 1st. 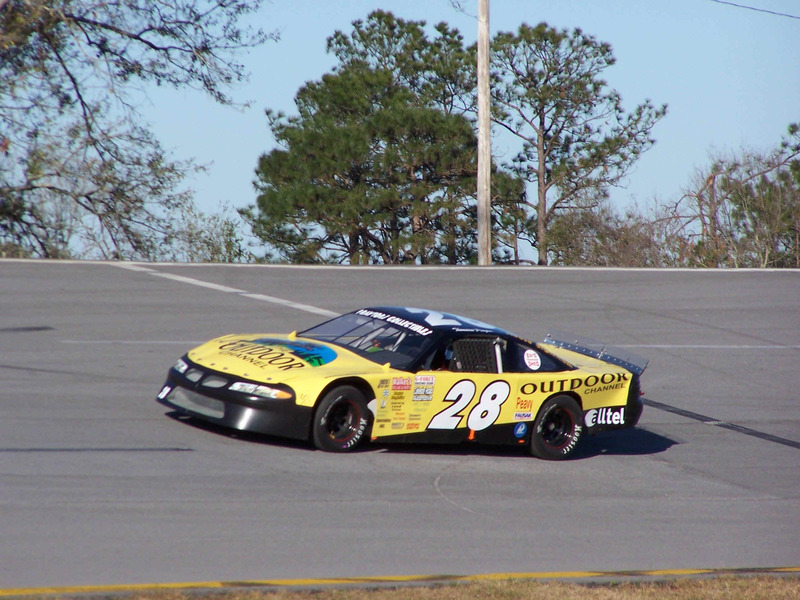 With the start of the new year, Max Force Racing rolled out it's newest car with it's 2006 Mobile International Speedway Rookie Candidate for his first test behind the wheel of The Outdoor Channel Pontiac. Thomas Praytor or the Moose took to the high banks of MIS like a duck takes to water. The heavy 3,300 pound stock car was sluggish compared to his 1,200 pound legend car and required some driving style changes and a new appreciation for the brake pedal. The Moose wasn't the only one trying to adapt, our race team was used to setting up cars for a 45 year old fat guy. A lighter, younger driver required some changes in setup that we are still working on at the shop. A solid test with over 100 laps in the book has the Moose looking forward to his next test scheduled for February after Speedweeks in Daytona. Thomas on his first test: "Compared to my legend car, the stock car is like driving a turbo charged tank. It took a little while but I got faster as the test went on and I didn't hit anything so it was a good day. I'm ready to go again."